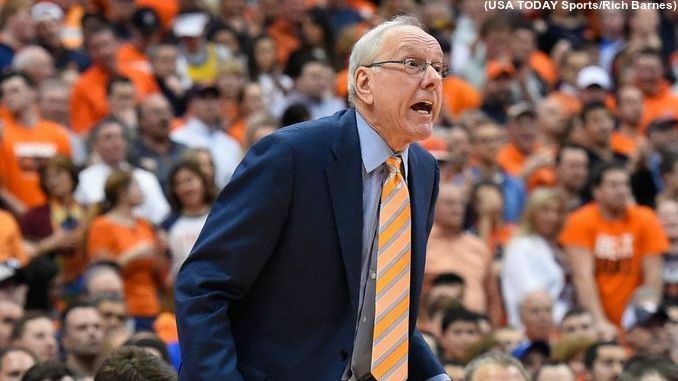 Jim Boeheim coaches during the first half of Syracuse's game. WHAT HAPPENED: A game after hurting its NCAA resume with a home loss to N.C. State, Syracuse got back to .500 in conference play by holding on against the ‘Canes to notch a hard-earned road victory, boosting its NCAA credentials. Both teams wore warm-up t-shirts showing support for this past week’s mass shooting at a South Florida high school that resulted in 17 deaths. ANALYSIS: In a game tied 25-25 at halftime with defense dominating, the Orange (18-9, 7-7) upped its lead to 12 midway through the second half before Miami (18-8, 7-7) stormed back to tie the game at 43. But the final four minutes SU had enough offense and defensive stops, finishing with 64% shooting overall, holding UM to 33% shooting, and forcing 11 ‘Canes turnovers, to prevail. HERO: Picking up the offensive slack for Tyus Battle who was hounded consistently and had trouble shooting from beyond the arc, Frank Howard had half of his game-high 18 points after halftime to go along with six assists, two rebounds, a steal, block, and just one turnover. Marek Dolezaj had a solid game with 11 timely points, three boards and two assists. ZERO: A rare “off” game for Battle, averaging 20.2 points per game, even though he hit a key three point basket and some foul shots late to ice the game away. SU’s leading scorer finished with 11 points on 4-for-14 shooting. WHAT’S NEXT: Syracuse returns home to face No. 14 North Carolina Wednesday, Feb. 21. The Orange is 1-5 against the Tar Heels since joining the ACC (including one loss at the 2016 Final Four). Carolina ( 20-7, 9-5) plays at Louisville Saturday evening. Game time: 7:00 p.m. ET / TV: ESPN.